In what sounds like a bad punchline from a late night talk show monologue, American Presidential candidate, Hillary Clinton, claims Pepe the frog is a white supremacist icon. In response, the media-labeled "'alt-right' movement" has stepped-up the meme's usage in its Donald Trump campaign propaganda. Pepe the frog first gained notoriety amongst the 4chan set in the late-2000s. 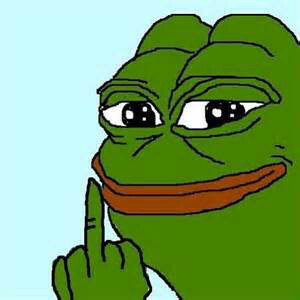 Pepe is a character from Matt Furie's comic, Boy's Club, and has been used in countless memes since at least 2008. The connection to the "alt-right," a name given a general collective of Right-Wing American nationalists, appears to center on a single, anonymous Twitter user specified in this article from famously partisan faux news outlet, The Daily Beast. Despite the, at best tenuous, connection between the two, American media and the Hillary Clinton Presidential Campaign ran with the story. Pepe the Frog as a white supremacist icon is a PR campaign created by the Hillary Clinton camp, and seized upon by social justice warriors and alt-right supporters alike.